This 30cm short mixed color wig is pretty thick. It has nice curly in the hair tips and with very stunning & passion burgundy color as decoration. It’s not just a cosplay wig, but also a very amazing fashion wig. It does have a fair amount of shine, but after a wash and a bit of dry shampoo, it’ll be perfect. Besides the luxury burgundy color, the black color in this wig is also very pretty, its soft fibers make the whole wig very expressive and can be standed out even compared with other more expensive wigs. With random setting of the bangs can create different effects! Is Fringe Very Important for A Wig? 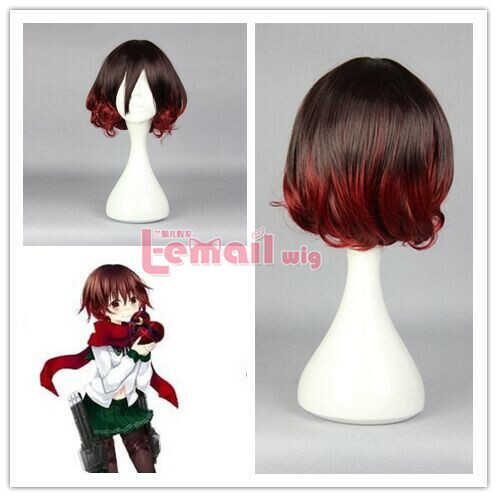 This entry was posted in Buy Cosplay Wigs, Fashion Wigs, Wigs and tagged 35cm fashion wigs, cheap fashion wigs, mixed color wigs, short length wigs.